Deluge 1000 is a bio-degradable, nonionic wetting and spreading agent for agricultural use. 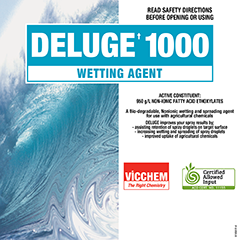 Deluge 1000 is a nonionic wetting agent that is compatible with most agricultural products. It can be used in both acid andalkaline sprays and will mix easily with most types of water used for agricultural spraying.Deluge 1000 is highly concentrated and therefore well suited for Broadacre applications. Deluge 1000 will improve the performance of most broadacre agricultural products within the typical use range of 100 – 200ml/100 L of Spray Volume. When applying Deluge 1000 with soil residual herbicides to standing weeds,a higher usage rate maybe required. Deluge 1000 must always be used strictly as directed on product labels.This is particularly important when using Deluge 1000 with selective herbicides to ensure crop safety. Manufactured according to a quality management systemensuring quality,consistency and reliability. Based on renewable materials – Biodegradable.